I learned how to make an egg salad recipe many years ago. I found it is one of the easiest and most economical salads you can make when learning how to boil eggs. It is delicious served as a sandwich, on toast, croissants or bagels. It is also good just served in a dish or with a green salad. It can be eaten any time of the day. 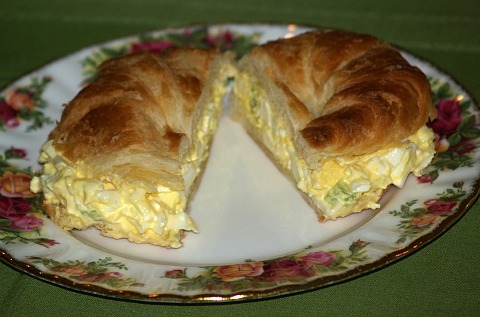 Although egg salad can be kept in the refrigerator for a couple of days, I prefer to eat it as soon as it is made. I think it has a much better taste when very fresh. Even something as simple to make as an egg salad, there are a wide range of ideas as to what should go into it and how the eggs are chopped. I prefer the eggs to be more coarsely chopped if I am using them on a sandwich or if it is to be eaten from a dish. For this I add chopped onion, chopped celery, relish and mayonnaise; I like to be able to see the eggs with the vegetables. Combine all ingredients and serve on a sandwich or from a dish. Line salad bowl with lettuce leaves. Alternate layers on lettuce leaves with sliced hard boiled eggs and thinly sliced onions. Combine and mix the vinegar, salad oil, salt, pepper, paprika, and Worcestershire sauce; pour over the layered salad. Sprinkle top with cheese and garnish with parsley. 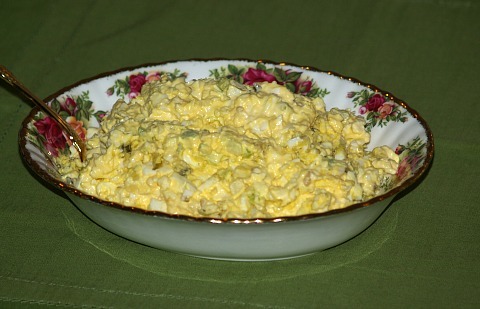 Learn how to make this egg salad recipe which is a little different but very good. It goes well as a side salad for dinner. Dissolve gelatin in hot boiling water; add cold water to cool. Add vinegar, mayonnaise, salt and pepper; blend slowly with mixer. Pour into freezer tray and quick chill until edges are firm but soft in center. Scoop mixture into mixing bowl and whip with beaters until fluffy. Fold in the eggs, celery, green pepper, pimento and onion. Pour into loaf pan and chill until firm.